Whatever Hoogie does is not right. When Tweezle squishes food, ‘Everyone laughs.’ When Hoogie does it, she is told to ‘not be such a baby.’ Similarly, she is ‘too small’ to help dad. ‘Too big. Too small. No room for me at all,’ sums up the pain she feels. In the end just like ‘the sun in the middle of the solar system,’ Hoogie isn’t so invisible anymore. McLellan finishes her story with a deliciously sweet simile! This loveable family comes alive with Dean Griffiths cuddly personified monsters. Vibrating hues painted in pencil crayons and watercolours evoke an expressionistic style with realistic elements. The clever use of negative space adds dimension and energy to the characters as well. Consistent rendering makes switching from each book in the series a seamless transition. The difference is the focus on the title characters, e.g. Hoogie holding a donut over one eye exaggerating the fact that she feels “like the hole in the middle of the donut’ or Tweezle holding a large beach ball reinforcing his babyish stature. 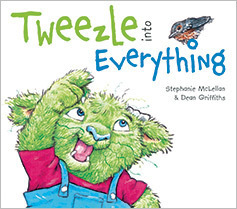 “Tweezle into Everything is a great book for young children. It can be used to help young children who may be struggling with the challenges of not being able to do what older siblings can do, or for slightly older children who have younger siblings. The clear language and straightforward plot make it easily comprehendible for young children. Dean Griffiths has illustrated the book in bright, cheery colours that will appeal to young eyes and hold their attention. There is quite a bit of detail in the illustrations which can invite interaction with the storyteller and the child.